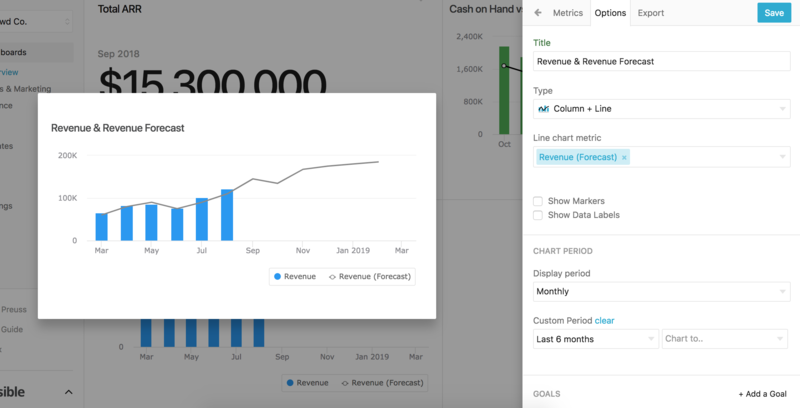 By giving a unique design to your budget or forecast data, your viewers will be able to quickly understand the Actual Data vs the Forecasted/Budgeted future data. Luckily Visible makes it super easy to customize different options! For this example I am using Revenue & a Revenue Forecast. In the options tab, we choose to use "Column + Line" with the forecast being the line. This lets the viewer quickly discern where you are performing to a budget or forecast without having to interpret a legend. To finish this chart, we are going to make the forecast line "dotted" to give the visual clue that it is not actual operating data but a forecast/budget. To accomplish this, just navigate to the "Metrics" tab and click down on the metric you want to make a dotted line. Select "Dashed" for line type and you'll be set!